This post is sponsored by Vitamix in partnership with The Feedfeed. All opinions expressed are my own. Thank you so much for supporting the companies that keep this blog going. 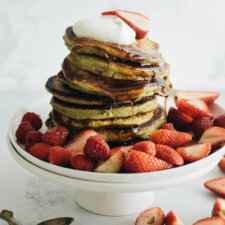 These light and fluffy matcha pancakes are served with fruit, whipped cream, and maple syrup. Not only is it super delicious, but it also makes a stunning presentation. Perfect for Mother’s Day brunch or a Sunday breakfast with your loved ones. I’m not the type of person who misses home every second. However, when Mother’s Day approaches, I do miss the mother-daughter time I had back in China. 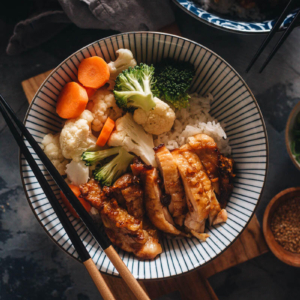 My mom has a sweet tooth – on the weekends when we went to the mall, we would always go to our favorite Hong Kong dessert place, order bubble tea, and snack on small plates. 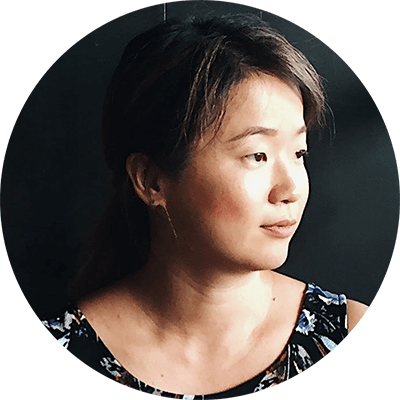 While my choice of snack has always been salty things, such as crispy tofu and chicken wings, she prefers sweet pancakes and waffles. Although I’m not able to spend this year’s Mother’s Day with her, I decided to develop this recipe as a Mother’s Day gift. After she retired, she started to learn to make desserts at home, and she enjoys hosting brunch with her friends. 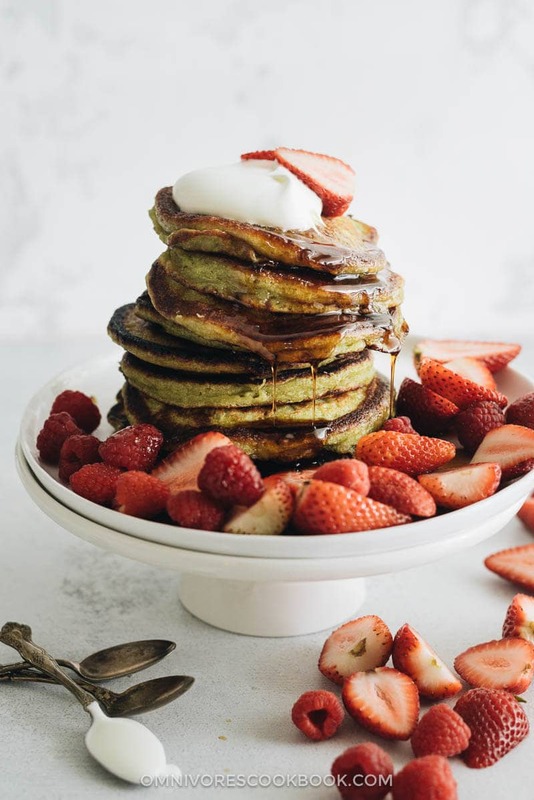 These matcha pancakes are perfect for such occasions. 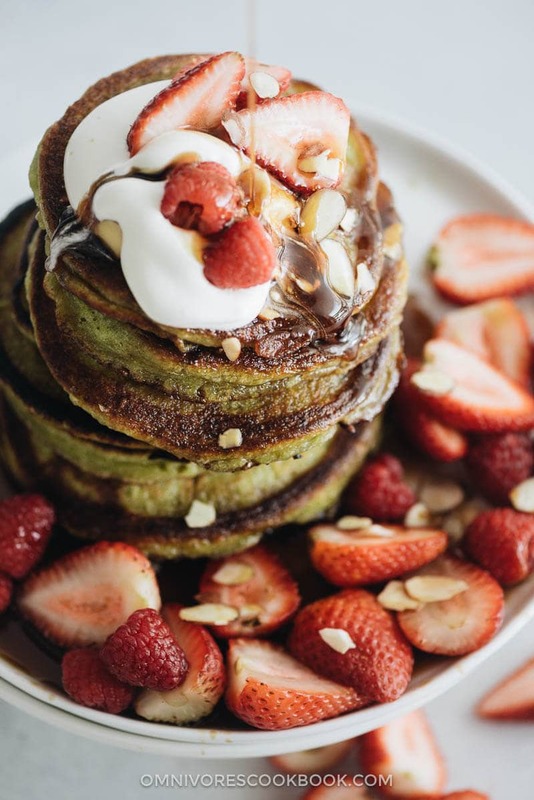 These matcha pancakes take no time to prepare. They have a beautiful mild green color and a fragrant green tea taste. I garnish them with whipped cream and strawberries, which makes a stunning presentation. 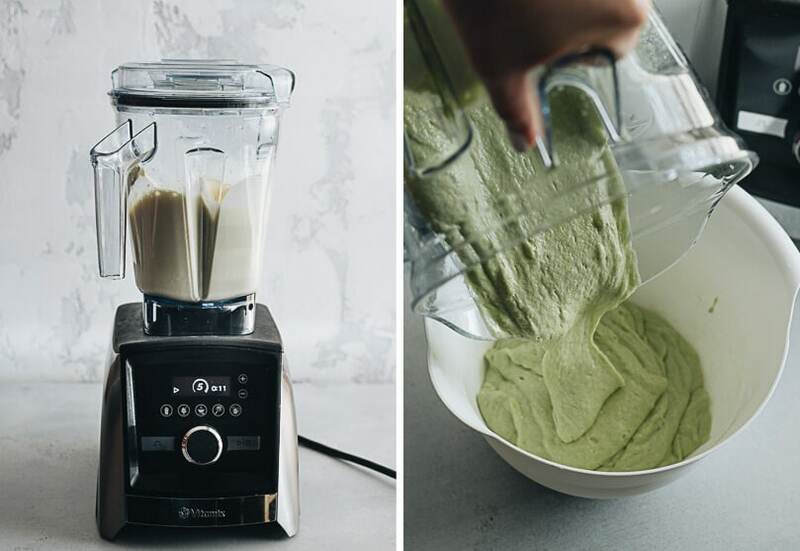 I used my Vitamix to make the batter, which cuts the prep time down to as little as 5 minutes. However, you can make this recipe without a blender, as well (I’ve included the method in the recipe below). Make sure you use a large skillet so you can cook several pancakes at a time. I enjoy serving the pancakes with whipped cream and just a drizzle of maple syrup, which brings out the green tea flavor. I also serve extra fruit on the side to snack on. Serve some mimosas in champagne glasses, and you’ll have a beautiful, delicious, and full brunch ready in 20 minutes. Here comes the exciting news – to celebrate Mother’s Day this year, I’m partnering with Vitamix and The Feedfeed to give away a Vitamix A3500 (Ascent Series) to one lucky winner. 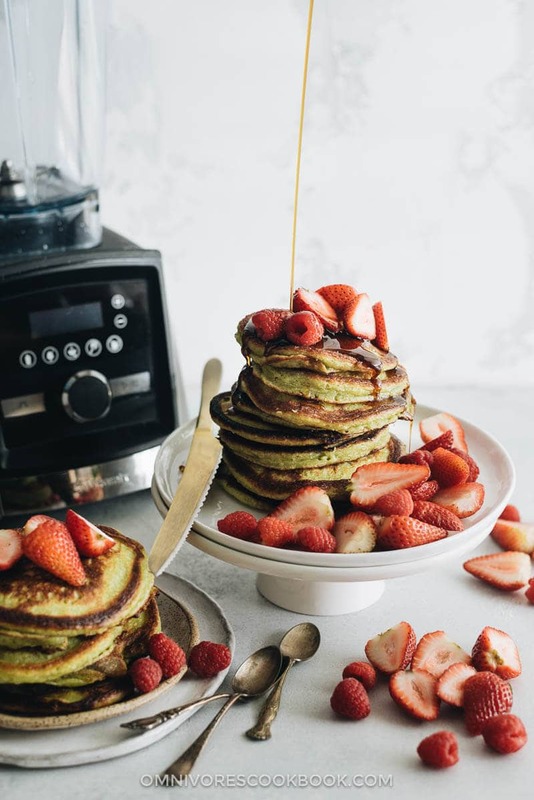 Enter for a chance to win so you can start making delicious matcha pancakes in your own kitchen! (Bonus entries) Tag one or more friend(s) on Instagram. For each friend you tag, leave a separate comment at the bottom of this blog post with your Instagram handle and your friend’s Instagram handle. You must complete the first two steps to enter the giveaway and you have unlimited bonus entries to increase your chance of winning. This giveaway will open on May 4th (Friday) and close on May 13th (Sunday) at 11:59 pm CST. This giveaway is open to U.S. residents 18 years of age or older. One winner will be selected via Random.org and contacted via email, so please include a valid email address in the email address entry box (Your email address won’t appear in the comments below). Combine milk, melted butter, eggs, and vanilla extract in a blender (I used Vitamix). Blend at medium speed until everything is well mixed, 30 to 40 seconds. Add the mixed dry ingredients into the blender. Mix at low speed for 20 seconds, until the flour is just incorporated and it formed a runny batter. Transfer the batter to a big bowl. Add oil to cover the bottom of a large skillet and heat over medium heat until hot. Turn to low heat. Use a 1/4 cup measuring cup to transfer batter into the pan to form pancakes, with some gap in between. Cook until the bottom browns and bubbles pop on the surface, 1 to 2 minutes. Flip the pancake and cook the other side until lightly browned, 1 minute or so. Transfer to a big plate. Cook the rest of the batter using the same method. Add a bit more oil if needed. 1. Adding sugar will give the pancakes a more refined taste and create a delicious char on the pancake edges. However, it will also make the pancakes brown easily, so be sure to cook over low heat and keep an eye on the bottom side. The first thing I’d probably make would be a smoothie. I would make smoothies first if I had a Vitamix! We love throwing all kinds of veggies, fruit and flax or chia. For step 1, i tagged a friend on a @vitamix post. The first thing I would make is vanilla bean ice cream. I would make a green smoothie with a vitamix!! Nice giveaway, if I can enter, thank you! I’m not on the Instagram Zuckerberg train, tho. Soooo many amazing recipes to be made with a Vitamix!! It’s hard to decide, but I’d love to make super rich coconut curry pumpkin soup or the smoothest nice cream! My instagram handle is @gabrielamariana9 and I tagged @maruchirt. These pancakes seem like the perfff Vitamix recipe!! My instagram handle is @gabrielamariana9 and I tagged @upciclozerowaste. 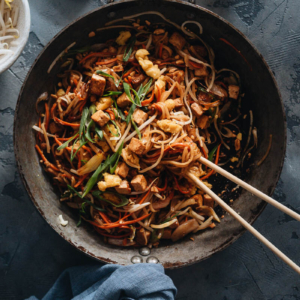 Am also dying to try your Rainbow Longevity Noodles recipe with a Vitamix! My instagram handle is @gabrielamariana9 and I tagged @elpacificopr. 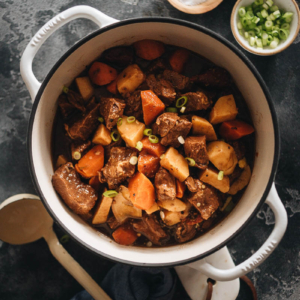 https://www.instagram dot com/ iselsharisse / Three stars for the recipe just for sounding so awesome yum! Nonetheless, the first recipe I would try with my very own Vitamix is cocoa nibs hot cocoa because the 3 lb bag of organic, raw nibs is going very slowly with us munching a few here and there, and our blender just can’t do them justice. Next I’d the Match Pancakes, and maybe even a Matcha cocoa nib knock off your recipe! I would make pancakes, smoothies, popsicles, so many endless options! My Instagram handle is @mydiaryofus ! Great giveaway! What a great idea – I can get my caffeine fix in a stack of pancakes! I think this will help me wake up on a lazy Sunday morning. Thank you for the recipe, and I will skip the giveaway. Cashew butter for one, as well asthe silkiest, creamiest smoothie bowls. ? I would totally make this recipe! Viramix would also be great for making milkshakes! A green tea frap sounds perfect! I would make my own nut butters and try fun combos. 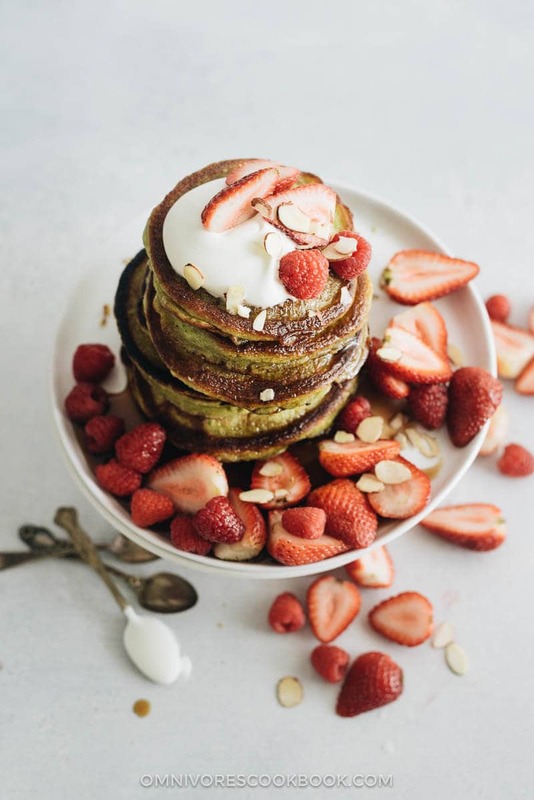 I would make this fabulous matcha pancake first! What WOULDN’T I make?? :-p endless possibilities I’ve dreamed of it I could get one of these! And I would love to make this recipe celiac friendly (glute free) and dairy free! I also have been wanting to make something a friend made me with the vitamix once, it was a chocolate mousse made with cashews and avocado and cocoa powder!!! Yum yum and super healthy!! I would totally be making all sorts of heath smoothies and turning recipes into celiac/dairy free/ thyroid healing recipes! If I had a vitamix i’d make breakfast matcha and peanut butter smoothies with spinach and banana! Hummus and other bean, veg and fruit purees—so smooth! I would make a bunch of sauces for noodles, vegetables, meat marinades so dinner can be done in no time, anytime! I’m in love with matcha & pancakes, I would share it with friends and family. I would try making your pancakes! If i had a Vitamix i would make a pistachio hummus. Also my friend has one and she says she can use all the plants and grind up the seeds, even avocado seeds for extra nutrients, so this must be a pretty amazing machine!! If I had a Vitamix I would make lots of smoothies in addition to lots of soups and nut milks. Oh my goodness, these look so delicious! I am pinning this STAT so I can try them out! What an awesome blender, I would first make homemade chimichurri sauce! I would make matcha crepes!! I would make cauliflower pizza crust. I always wanted to try . These pancakes looks so delicious! Thanks for sharing. Lately I have been making oatmeal bowl for breakfast every morning. It’s been amazing but summer is coming, i want to make something way cooler (literally) such as nicecream bowl for breakfast. If i win this vitamix, i will be making nicecream all summer 18. I would make nut butters and almond milk if I win a Vitamix. I would make gazpachos/soups, keto fat bombs, frittatas, and dips with the Vitamix! @soyalifrias honestly, I would do smoothies everyday so I won’t forget eating breakfast. Sounds like a great machine for lazy girls. I would probably start with smoothies, since that is all I can make in my blender. I would have to do a lot of reading to see what a Vitamin can do! Can you tell me what brand of Matcha you used on the green tea pancake…I used a premium brand from Taiwan and didn’t come out green at all, it looked rather brownish.